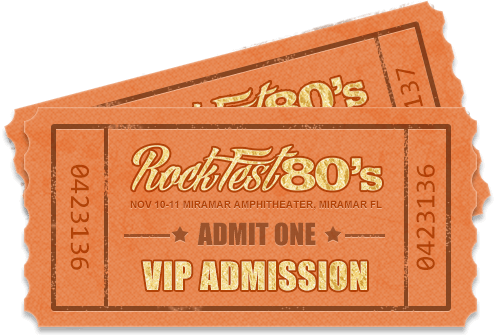 Includes General Admission access to RockFest 80s. Tickets available in limited quantities and while supplies last. 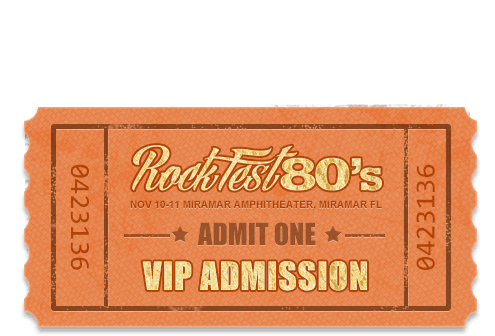 RockFest80's is an all ages event. Children ages 3 and under are free. 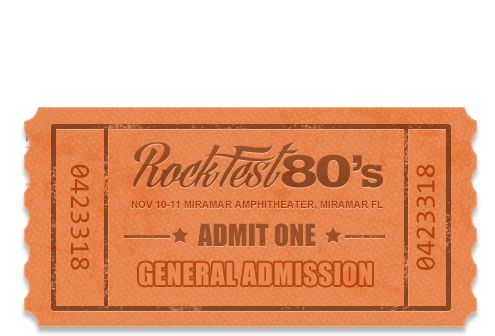 RockFest80's is an outdoor event. Please only purchase tickets through this site and our official purchase pages on TicketMaster.com. We are not responsible for tickets purchased through any unofficial sources. Management reserves the right, without the refund of any portion of the pass/ticket purchase price, to refuse admission or to eject any person who fails to comply with the rules of the venues, local, state or federal law, or whose conduct is deemed illegal, disorderly, or offensive by management. All persons entering the venues are subject to search for prohibited items including but not limited to: contraband, unauthorized merchandise, alcohol, controlled substances, weapons, firearms, fireworks, cameras, video equipment, and recording devices. 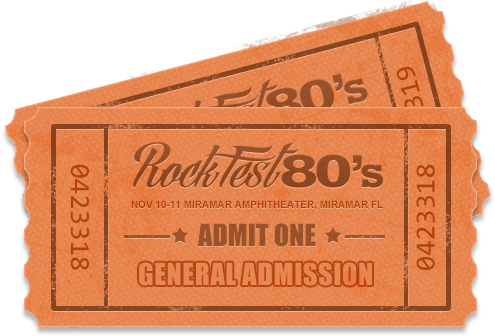 Tickets may not be used for advertising, promotion (including contests and sweepstakes), or other trade purposes without the express written consent of RockFest Concerts. Includes General Admission access for Saturday, November 10th only. Each price level available in limited quantities and while supplies last. Includes General Admission access for Sunday, November 11th only. Includes General Admission access for Saturday, November 10th and Sunday November 11th. VIP admission into venue for Saturday, November 10th. VIP admission into venue for Sunday, November 11th. VIP admission into venue for Saturday, November 10th and Sunday, November 11th.